Description Of Item: The sci-fi classic BattleStar Galactica lives again! Joyride Studios has released action figures and vehicles based on the hit TV show. 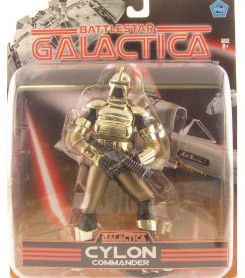 Collectors will be finally be able to get their hands on figures that resemble the show's actors?a first for Battlestar Galactica toys. Richard Hatch as Apollo, Dirk Benedict as Starbuck and Lorne Green as Adama are some of the realistic figures coming out?not to mention the nefarious Cylon Centurion. Each figure will stand approximately 7" high and will feature 7 to 12 points of articulation and include accessories.